IPOB condemns “Unlawful & Undemocratic” Senator Abaribe’s Arrest, Petitions British Government. It is no longer news that the demonic government of the Fulani Caliphate at Aso Rock, controlled by the cabal, is at it again. We the Indigenous People of Biafra (IPOB) must remind the world and especially the British government that what their beloved Fulani rulers of Nigeria are doing with political power is an open call to anarchy. Britain, as the creator and controller of the destiny of Nigeria in perpetuity, must prevent the impending catastrophe by impressing upon the Fulani tribe the need to at least follow the rule of law in the dispensation of their cruel version of justice. Other ethnic nationalities in Nigeria may have been cowered into submission by the Fulani caliphate; that will never become the fate of the East. We will resist it with the last drop of our blood whenever we called upon to do so. As the uncontested and rightful owners of Nigeria, which they single-handedly created, Britain must as a conscientious democracy and matter of urgency ask the Islamic Republic of Nigeria to release Senator Enyinnaya Abaribe without further delay. It is quite disturbing that Fulani Aso Rock cabal in control of this APC government do not know that law courts exist for a reason. No better authority is in a position to point this out to the Fulani caliphate than those that created and still control Nigeria. We, therefore, call on the highly respected representative of Her Britannic Majesty in Nigeria, Rt. Honorable Paul Arkwright, to get hold of Fulani leaders in the north and warn them of the consequences of their actions. Without affording ample time for the politically orchestrated Greek gift presented to the Yoruba race in the name of June 12 declaration and national honors, the dictatorial cabal at Aso Rock yesterday directed their SSS (DSS) to arrest and detain the outspoken Igbo senator for reasons yet to be publicly disclosed by the government. It is on record that Senator Abaribe has been a vocal critic of the present dictatorship and equally stood as surety for our leader Mazi Nnamdi Kanu. Information at our disposal has it that the State Security Services (SSS) or DSS as they are commonly called, spent last night and into the early of this morning at the residence of Senator Enyinnaya Abaribe in the Apo District Legislative Quarters searching for what they said to be IPOB insignia and materials that will one way or the other constitute an indictable offence. The SSS operatives conducting the search ludicrously insisted that our leader Mazi Nnamdi Kanu had taken refuge in Senator Abaribe's house in Abuja. Up till 3 am, this morning SSS men were still at his residence demanding that he produce Mazi Nnamdi Kanu. Our intelligence has uncovered specific details which point to the fact that their belated introduction of Abaribe's purported link with IPOB as forming part of their original enquiry, is a clear diversion from what they actually set out to achieve from the onset which is not unconnected with the criminal padding of power sector budget by the corrupt Aso Rock cabal. Senator Enyinnaya Abaribe should be commended by all anti-corruption crusaders and agencies in the world not hounded for his patriotic and speedy exposure of the forged documents this government inserted into the budget as presented to the Senate. Senator Abaribe's crime is that he raised alarm on the floor of the Senate about how 30 billion Naira was strangely smuggled into the power sector budget when no such amount was ever part of the original budget presented to the National Assembly for approval. This is bare-faced fraud on a monumental scale. Instead of making clarifications on this embarrassingly open fraud perpetrated by the government, the Fulani Aso Rock cabal instead sent their Gestapo SSS, to intimidate and shut him up. Adolf Hitler will be proud of the ruthlessness and cruelty of the Nigerian SSS. This is where Britain must step in and live up to its stated colonial and moral responsibility of training the Fulani caliphate on the tenets of democracy and the need to embrace it. Failure to do so will lead to untold misery and bloodshed for all. The tolerance level of the masses has reached a breaking point. This government must be called to order. 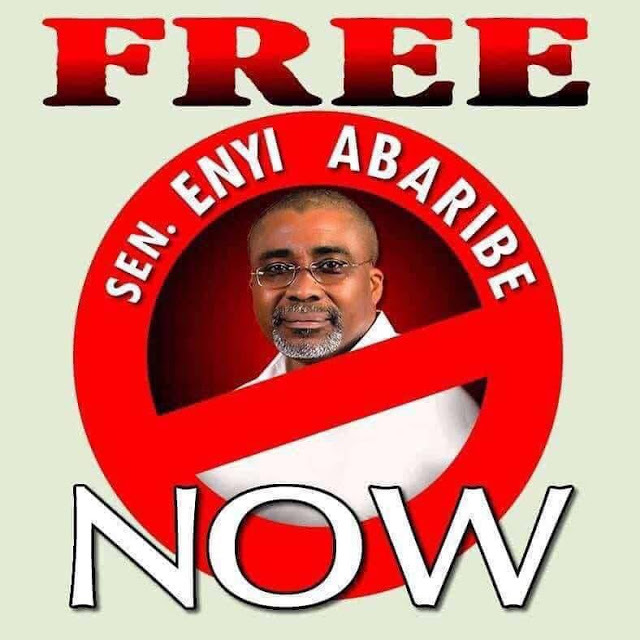 Senator Abaribe cannot be arrested in the manner SSS did because there are laid down procedures and rules for inviting a sitting Senator to submit him or herself for any form of investigation by any security agency. Instead, they chose the Gestapo option to accomplish their evil designs and to embarrass him. Those who deserve to be arrested by SSS are those in Aso Rock that sought to defraud the public by criminally seeking to appropriate extra 30 billion Naira for themselves through the 2018 budget.